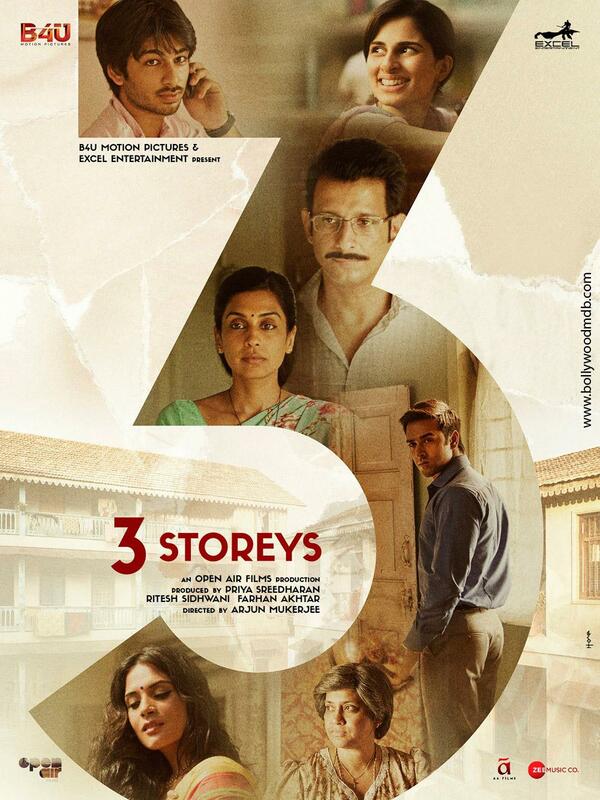 3 Storeys is a film which is niche to a great extend. Despite that it boasts of several strappings of commercial cinema. 3 Storeys is set in a dilapidated chawl of Mumbai, inhabited by people with different dispositions. The movie explores interwoven lives of some characters that have some secrets up their sleeves. Leela (Richa Chadha) narrates the story of some of these characters to us. One story is about a Christian widow Flory Aunty (Renuka Shahane) who has an old score to settle, the other story is about a housewife Varsha (Masumeh Makhija) who is trying to make both ends meet as her jobless husband sits at home living off her. Then there is a love story between Sohail (Ankit Rathi) and Shalini (Aisha Ahmed). What happens with them when some well-guarded secrets of their lives are revealed? How they make up for the loss the revelations cause? To know, watch the film. If you can watch films with multiple stories with as much interest as regular ones, you will fall in love with 3 Storeys. Apart from a bunch of brilliantly written and executed stories, the film scores well in acting department. Every actor, be it Renuka Shahane, Pulkit Samrat, Masumeh Makhija, Sharman Joshi, Ankit Rathi or Aisha Ahmed, has played their parts with utmost honesty. Actress Renuka Shahane, who is making her comeback to movies after a long time, is a treat to watch in the competently written character of Flory Aunty. She surprises you with her performance. Pulkit Samrat in his role is also fine. Sharman Joshi gets a limited screen time but he does full justice to his character. Newcomers Ankit Rathi and Aisha Ahmed are also convincing in their parts. Actress Richa Chadha is also there in the movie but a lot more was expected from her. Her screen time is short but yet she leaves a mark. 3 Storeys has been helmed by Arjun Mukerjee. He is an ad filmmaker who has directed a series of advertisements for several prominent brands. His experience as an ad filmmaker comes handy in 3 Storeys, it seems. He has built interesting characters - characters that look real and believable. There is a certain intrigue about them which compels you to know more about them, their world and issues they are grappling with in their lives. Mukerjee makes an honest attempt to tell an engaging story and succeeds in it flawlessly. Having said that, there are some minor dots which the film fails to meet, especially post interval. Major portions of the film have been shot at real locations which add authenticity to the film. The costume designer seems to have put extra efforts in making all the characters look as real as possible, which is just great. Talking about other technical aspects of the movie, background score is good and so is editing. Every department has lent their full support in making 3 Storeys look as beautiful as it does. Clinton Cerejo and Amjad-Nadeem have scored very subtle and situational music for the movie with most of the songs turning out to be melodiously soulful, especially "Bas Tu Hai" and "Azaadiyaan", both composed by Clinton Cerejo. "Raasleela" by Amjad-Nadeem leaves a good impression after you listen to it a couple of times. Singer Mohit Chauhan makes the song "Zaroori Bewakoofi" standout from the rest with his magical voice. Overall, 3 Storeys has an album that does its job well. Frankly speaking, the concept of weaving multiple stories in a single film hasn't been explored much in Bollywood. There have been only a handful of Hindi films which dealt with such type of narratives. You may like 3 Storeys if such kinds of films are your cup of tea. If not, then you can pick some other flick releasing simultaneously with it. The release date of Gold has been pushed on Akshay Kumar’s request? Anupam Kher bags BAFTA nomination and Bollywood biggies showered their love on him!